Shakespeare Schools Foundation (SSF) has been awarded the Grant for Young Artists in the 30th anniversary year of The Praemium Imperiale. Awarded by the Imperial Family of Japan on behalf of the Japan Arts Association, the global arts prize includes five categories not covered by The Nobel Prize – painting, sculpture, architecture, music, theatre and film. The prizes are awarded for outstanding contributions to the development and promotion of the arts. SSF uses the unique power of Shakespeare to transform lives. At its core is the world’s largest youth drama Festival. Every year, Shakespeare Schools Festival unites up to 30,000 young people from all backgrounds and abilities in a journey that increases confidence, resilience and teamwork, giving thousands of young people from across the UK the crucial skills they need to succeed in life. The six month process culminates in exhilarating performance nights from primary, secondary and special educational needs schools at up to 136 theatres nationwide, every autumn. This year marks SSF’s 18th birthday and the charity is celebrating working with 300,000 young people since it was established in 2000. Last year, SSF reported that, as a result of taking part in the Festival: 99% of teachers agree that their students’ confidence increased, 90% of teachers said that their students were more enthusiastic about school and learning and 93% of students said that they enjoy working as a team more. The announcement of the award came on Wednesday 11 July in the Royal Academy’s new Benjamin West Theatre. 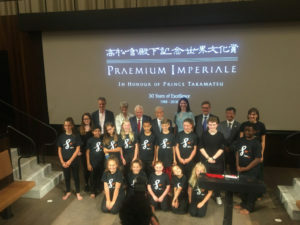 Festival schools, St Marylebone School and Greenfields Primary School, performed vignettes from Hamlet and Julius Caesar to an audience including The Japanese Ambassador to the UK and Lord Patten of Barnes, the UK’s International Advisor to the award. 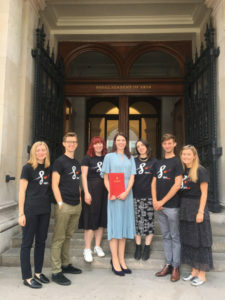 Chief Executive Ruth Brock said: “On behalf of Shakespeare Schools Foundation I am deeply honoured to accept the Grant for Young Artists Award. Shakespeare is the birthright of every child. His extraordinary works with their universal themes and beautiful language can, with the right help, belong to everyone. With SSF, children make friends, do better in class and gain the skills they need for life. Further than that, art transcends borders, heals divisions, nurtures empathy and collaboration. And as the world’s greatest playwright, Shakespeare teaches us all more about what it means to be human. © Copyright 2019, Education Today Magazine. Datateam Business Media Limited. All rights reserved.